ProphetLine for Windows POS software has been used for years by hundreds of specialty retailers. They rely on it to process thousands of sales transactions daily. ProphetLine for Windows has all of the features expected in a quality point-of-sale system, plus many not available in any other POS package. ProphetLine for Windows accounting and communication functions are seamlessly integrated with our point of sale system. 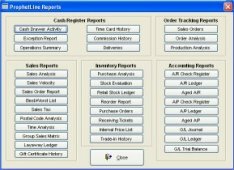 ProphetLine for Windows also has interfaces to Intuit QuickBooks or Microsoft products, including Small Business Manager. We know that one of the most important features of a POS system is speed. To better serve your customers, ProphetLine allows you to complete a transaction in as few as five keystrokes. ProphetLine provides a touchscreen or keyboard interface. It lets you decide which interface best suits your retail business needs. The System Manager engine for our retail management system is comprehensive and easy to use. It provides you with all the cash register functions. In addition, it includes powerful register reports for audits, sales margins, sales taxes, inventory, and time cards, as well as stock check forms and reorder reports. For multi-store operations, the Communications Module enables your home office to retrieve daily store data automatically. It can be programmed for automatic retrieval at the most economical time to save long-distance charges, and it is FTP-based, which is more reliable than other systems. Point of sale transactions are transmitted quickly and easily to the home office. The Accounts Receivable Module handles customer accounts efficiently and accurately, providing specialized customer files for single customers or customer groups. Features include customized pricing, sales tax, or billing for special customers, as well as automatic sales posting to the accounts receivable journal. Invoicing is done straight within the POS system, not a separate accounting module. Designed with retail managers in mind, the Accounts Payable Module provides comprehensive menu choices to make bill paying as painless as possible. Enter your vendor’s invoices, and ProphetLine automatically provides you with precise cost margins on sales analysis reports for a true picture of your operation. Devised to greatly simplify the task of personnel payroll, the Payroll Module provides automatic time cards with overtime and deduction calculations. The Payroll Module simplifies check printing–you can print to any standard computer check. Voiding and correcting erroneous checks is no problem. The General Ledger Module integrates other installed ProphetLine modules into a comprehensive accounting package designed with simplicity in mind. The General Ledger is transparently and automatically updated by the rest of the system, including the point of sale, to create financial statements and reports. For retailers who manufacture goods, the Manufacturing Module tracks material usage by production resource, allowing integration of shrinkage control policies. It also includes inventory kits to simplify pricing. The Sales by Resource reports show how much material is used by a given production resource.